Not only is this a single lens 3D camera, which is rare. It also has bunch of other great features including a (to some) actually useful digital zoom. Sony calls it ‘by Pixel Super Resolution’ which adds 5x extra optical zoom mechanism, (supposedly) without loosing quality. If it’s real or just a marketing trick remains to be seen until a full review has been done. 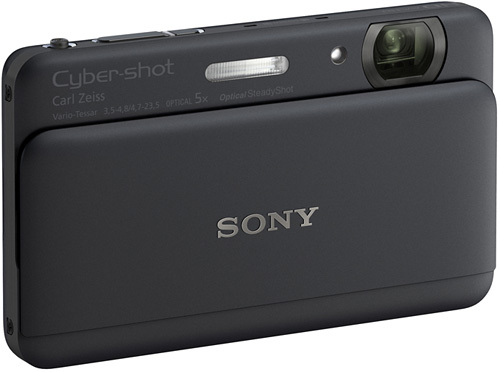 Also the new DSC-TX55 Cyber-shot is only 12.2mm thin which is apparently just a bit thinner than a AA battery. It has a 3.3″ OLED touch screen, shoots HD video. Also during recording it can take photos, so you don’t ever miss anything. For a side note it seems to have a lovely rubbery surface. I don’t however know if it is one of sony low light EXMOR lenses/sensors. But im sure it’s great anyway. Available in September 2011 for around 350$, so you don’t have to wait all that long if you want it. Next: How much will Apple stores tolerate? I was planning on buying this for my brother on his birthday. It seems really good. HOly hell, and i was saving up for a camera i saw at the dealer a week ago, this looks so freaking sweet in features!, now il have to wait! if it is thinner than a AA battery then what kind of battery does it use?